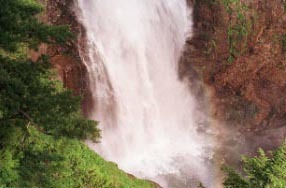 The hot spring and the fountainhead which gush automatically the foot of Hiuchigadake and at the northernmost end of an ozegahara are in superior [ of an inn ], and the mineral-rich sediment has deposited red.It is also an entrance of Hiraname Falls and Sanjo Falls, and the animateness is a must in two waterfalls for 2 both-way hours at each.There are various routes, such as the Rinkan course which goes via Miike to a Dankichi-new-root, through Ozenuma from the route which passes through an ozegahara from a Hatomachi, and the Numayama Pass. 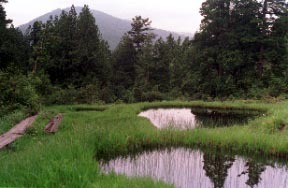 The summit of "Hiuchigadake" was gained from Miike and it resulted in the Onsengoya.Two intermediate marshes were wonderful and it was suitable for just calling it another world in especially the Kumazawa rice field cost. The route gone down to an Onsengoya in a straight line is an abandaned trail it's not in use by now. * The descent from Hiuchigadake to the direction of an Onsengoya is to the Numajiri course.It is said that the Miharashi course of shortcut blunders considerably.An Onsengoya way is an abandaned trail it's not in use by now. Hiuchigadake Although the Miharashi new root is a steep-slope muddy road It may be unable to pass. Since it is easy to become to the extent that it merely blunders to an ankle A stock is required for the prevention from a fall to spats to waterproof shoes.If it turns from the Numajiri route, distance will become it is long and tight for a beginner or persons of middle or advanced age.It is weak, and a whom who will be a course of 10 hours or more, and whichever it uses, it becomes for veterans. It is advancing using it for ascent, since the Miharashi new root is slippery.Hiuchigadake is reached from the Miharashi new root, and the route gone down to Miike is recommended, looking at the Kumazawa rice field cost under its view. It is a good location to see about an ozegahara and Mt. Shibutsu from an Onsengoya. 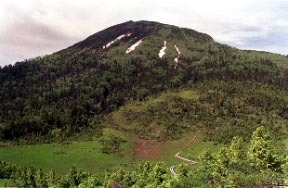 The takamine of the northeast 1, 2356 m of Hiuchigadake. This side is the Kumazawa rice field cost marsh. Hiraname Falls like a launching platform, and Sanjo Falls which is proud of the No.1 animateness of Japan -- they are both musts.Round trip about 2 hours from an Onsengoya. A calcium sulfate cold mineral spring and 24 "
Tokyo -> Joetsu Shinkansen about 1 hour and 30 minutes -> Jomokogen station -> Large Shimizu going bus -> the Oze Tokura change, about 2 hour -> Hatomachi-pass alighting. 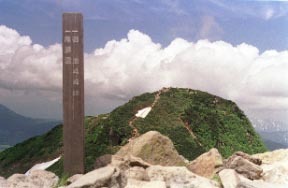 An ozegahara course is about 4 hours from a Hatomachi pass. 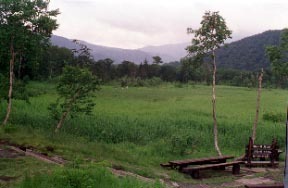 The Hiuchigadake course is about 9 to 10 hours from Miike. 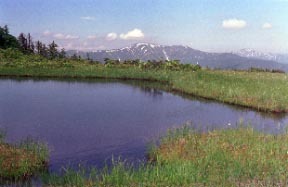 The Ozenuma courses are about 5 hours and a half from the Numayama Pass. Dankichi-new-root courses are about 3 hours and a half from Miike. * No matter where it may reach Hiuchigadake from, it is a gaining-the-summit climb down to entry, and it is about 8 hours.